After several attempts at putting together a commission for the next Open Design, I’ve got to admit to a certain degree of confusion as a publisher. While some folks were excited by the content of the adventures being considered on the KQ Forum, many of the questions boil down to “What edition will you be supporting?”. That’s an important element, no doubt, and it keeps a designer of adventures quite humble. Which may be a good thing. But I don’t want to burden patrons with seeing every option in two edition flavors, and asking everyone to vote BOTH for an edition and for an adventure pitch. Patronage shouldn’t be complex (and there’s a Open Design FAQ here to keep it simple). Instead, Halls of the Mountain King will be a very untraditional dungeon, an homage to Moria and Undermountain that does add a few twists. The maps will be done in the Ruins of Undermountain style (that is, maps drawn in close collaboration with the cartographer). Plot and story will be worked out collaboratively, though I have a core concept. The dwarves are a hard-working group, whose mining of adamantine lured them ever-deeper and whose pursuit of liftgas ore led them likewise into dangerous territory. The vertical dungeon goes from the depths of the earth through the great halls and works of a vanished clan, up to a snowy mountaintop spire. 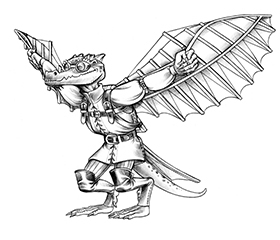 Possibly topped off by an airship dock, as suggested by Kobold Quarterly magazine’s recent article on airships. Much more detail to come in the Forums and as the result of patron discussion. Despite the emphasis on dwarven halls, I’ll be riding herd on the design to avoid cliches. No crypts loaded with undead, no orcs or goblins who rule the halls. Something else has led to the dwarven collapse. This dungeon will include roughly 20 tactical maps and a massive overview/cutaway of the vertical dungeon. With a little luck, it may also include a 3D/isometric map, like the ones in I6 Ravenloft. The adventure itself will have 40 encounters total. About half of them will be combat, a quarter traps/hazards, and a quarter skill challenges and roleplaying. For 3rd Edition patrons, this project will also include a 48-page Zobeck Gazetteer focused on the dwarves and gearforged of Zobeck, rituals for how to become a gearforged PC, the cults and devil worshippers of the city, and a section on Kariv life and culture, plus special rules for gypsy PCs and urban kobolds as PCs. And whatever else senior patrons request. For 4th Edition patrons, this project will also include a 48-page Iron Gazetteer. We’ll create new dwarven rituals, dwarven magical items, and clan lore and PC clan feats, and a LOT of new gear usable by non-dwarves as well. Plus a section of DM hazards for the delvers, adventure seeds for the DM, and a small horde of monsters appropriate to the setting. And whatever else senior patrons request. I’ll be writing the Gazetteers, possibly with direct contributions from senior patrons. I’ll definitely be writing at least one level of the Halls, possibly two or three, but I won’t be the only author. Professional freelancers and senior patrons will be able to pitch their work for the other levels. All patrons can vote on whose pitches are accepted. For the professional designers, I’ll stick my neck out and say that the Tim Connors, Nicolas Logue, and Richard Pett will all be invited to submit a professional pitch for a level of the Halls. Probably also Jeff Grubb, who previously contributed to Six Arabian Nights. Senior patrons and major donors may also throw their hats in, and traditionally their pitches have done well and have been included in prior projects. We’ll have three rounds of pitches, as we did in Six Arabian Nights and Tales of Zobeck. Requested length will be at least 8,000 words, possibly more. It’s easy to sign up. For your basic patronage, you get access to the design essays, design discussion, a copy of the PDF when it ship in late spring (June, at a guess), and the option to pick up a print-on-demand copy at your discretion. For $59.90 expert membership (two Basic memberships) you get access to the essays, design discussion, a PDF copy and may contribute complete design material for direct consideration (monsters, spells, items, rituals). You’ll have access to the playtest draft of the manuscript when it’s ready. At your option, you may also pick up a print-on-demand copy of the completed book, at cost. As a $89.85 senior patronage (three basic memberships), you gain access to the senior patron discussion and the pitching process (you may pitch one adventure proposal per round). You also get access to the playtest draft and other drafts, art, maps, personal critiques, and so forth. The commission must be met no later than February 28th has been muet. If the commission isn’t met, I’ll refund everyone and write … something else. Too soon to tell what that might be. I hope you join Open Design today and help shape the first major project of 2009! Review the Open Design FAQ, or comment on this commission in the Forum.